“What do you plan to do tomorrow? The jacuzzi walk or the waterfall trek?” Mr. Ge, the Dutch owner of Double Dutch resort looks at me inquisitively, as if knowing the answer. In the background, the sun sets over the placid waters of the Kamarajar lake, with the verdant Palani hills surrounding it. The choice was between being comfortable and being adventurous. Without a second thought, the latter was chosen. (This was also going to be my eligibility test for the Barsey trek in April). The serenity of Kamarajar valley demanded I do something off the beaten track to break the rhythmic, infectious calm I was being subjected to, apart from the delectable and homely South Indian cuisine dished out at regular intervals at the resort. Kamarajar valley is nestled between the Palani and Kannivadi hills and the town of Athoor, near Dindigul. I was surprised to know it is just 1.5 hours away from Madurai. Once off the main highway, a muddy, rustic road, flanked by coconut trees on either side, leads you towards the Kamarajar lake. The lake is home to a variety of migratory and resident birds, including several ducks, pelicans, and geese, making it a birding haven for avid birders. Tamil Nadu, primarily known for temples and architecture has a wilderness that is often unspoken of. It sprouts in scattered bits but rarely disappoints. Kamarajar valley with its lush green environs is a fitting example. The next morning, I geared up for the Waterfall trek armed with a walking pole for the brambles and full-sleeved clothing for the thorns. Kutty, our guide from Double Dutch accompanied our group of six, followed by the furry and friendly Simon, the pet dog at Double Dutch. We began walking on the road dotted with flowering pink bougainvillea, moving further away from the lake. The weather was clear, infused with a slight breeze and thankfully it wasn’t humid. Gradually the path became narrower and Kutty led us into the fields. “But where is the trail?” I wondered. Here the truth dawned on me: there was no trail. Emerald hills loomed in the background and the only sound giving us company was the rustling of tall grasses that we traversed through. The challenge was to not lose the person in front, lest I wanted to lose my way on a trail that had practically no-one except us and a host of butterflies. The first thirty minutes we encountered thorn infested bushes and the walking pole was a saviour: helping me clear my way and wade through. After the initial discomfort, I gradually began to enjoy this no -trail walk (the ascent hadn’t started). And just when I got habitual of the grass around me, the fields slowly disappeared. This is when I saw the brambles. A mesh of unkempt branches, protruding out in all angles, compelling me to crouch under them and crawl out. My mind was occupied and completely off mundane worries: that pending to do list, the pile of unanswered emails, all those ‘big’ things seemed too trivial at that moment. The priority was to duck under brambles well in time so my hair doesn’t tangle with the branches. Fifteen minutes and a few falls later, just when I mastered the art of ducking, came the boulders. The sound of rushing water grew louder, a definite cue that the waterfall was nearby. A steep, arduous twenty-minute climb (not for the weak-kneed) over boulders of all shapes and sizes was led by a first timer himself. Simon was found scurrying back and forth causing many tumbles as he brushed past everyone’s legs, wagging his tail excitedly. Kutty announced it. We had reached the waterfall. Exhausted and panting, I gaze at the crystal clear water, cascading down majestically over the rocks. The climb was certainly worth it. Worth the breathtaking panoramic views of the western ghats from the top, worth the feeling of dipping my weary feet in the cold water and worth the accomplishment of braving bushes, brambles and boulders to reach a pristine waterfall that only a few knew about. We were just a mountain away from Kodaikanal. I sat on the rocks, listening to the song of the forest, far away from civilisation, enjoying nature’s symphony and not wanting to descend. Beaming after braving the odds! It was here that Doreen proudly told me I could join her for the Barsey trek and all the brambles-bushes and boulders were worth it now. The descent was through the same route and took lesser time, with no unexpected surprises. At noon, I returned back to Double Dutch happier than ever, with a few scratches, minor bruises, torn clothes and a very special friendship with Simon. I also returned with a new name for the waterfall trek, proudly informing Mr. Ge it has been rechristened to the Bramble-Bush- Boulder trek for all his future guests. After all, why should only the Jacuzzi walk have a fancy name? 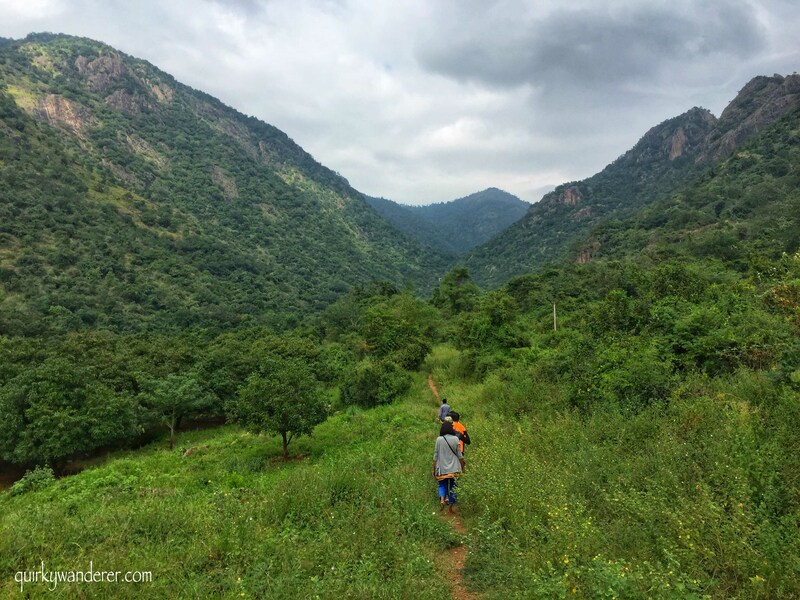 Kamarajar valley is an ideal weekend getaway 90 km away from the chaos of Madurai, for those looking for a tranquil holiday, nestled in nature. There are several homestays and resorts set up by foreigners around the lake. Double Dutch is one of them, built artistically by Mr. and Mrs. Ge, a Dutch couple, offering simple and satiating joys, this resort houses cozy cottages amidst lush, green gardens with vibrant blooms along pebbled walkways. One can enjoy plantation walks, watch the weaver birds flit in and out of their nests while gorging on homemade bread, jam and marmalade in the verandah of the resort. The staff is local, speaks English and arranges special candle light dinners on the terrace, under the stars. There is wifi in the lobby area, but mobile networks are bleak. Mr. Ge does a commendable job to make the region plastic free with regular cleanups along the lake, urging the local youth to do so too. Best time to visit: October to February. I did this in December 2017 with Doe’s Ecotours. Note: The Theni forest fire in March 2018 has brought to light, the need for protocols in trekking. It is best to go informed and only with experienced guides and appropriate permits. Join the tribe of Quirky Wanderers! Very interesting indeed – good description supported by super images !!!!! Thank you 🙂 glad you liked it! It sounded scary at a few stops. You never know what could strike you when…better to be safe. I would rather go on a proper trek. This is such a gorgeous place. Nice account of your experience.